Probably one of the most embarrassing things that happened to me in the last year was to be called a Hipster. At that point, I wasn't even sure what a hipster was, but I was pretty annoyed when I found out. For a start, I'm well North of thirty years old, and I don't think I've ever worn an item of clothing ironically in my life. (Not to mention the fact that my glasses aren't the big chunky kind). I'm definitely more of the 'is this item of clothing practical' rather than the 'will this look good on me' school of thought - much to the annoyance of my wife. Seriously guys, you're not superstars, you're not the saviours of gaming, you are not the freakin' Messiah. So get off that high horse and stop acting like you're 'better' than everyone else. Ha. Actually that was very therapeutic. I feel much better now. The point is I think that the label of "Indie" is slowly being taken over by a bunch of poseurs and wannabes... and as such, I'm not comfortable with that label. 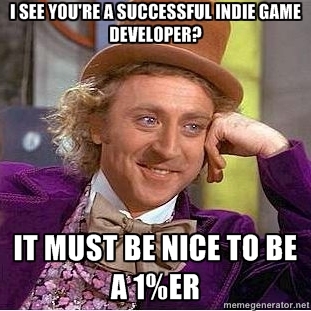 From henceforth, I shall be a "Gentleman Game Developer". I know this wasn't supposed to be a serious post, but your idea of the Gentleman Game Developer is gold. I say we henceforth conduct our development work garbed in tailcoats and trousers, spats and top hats! GDC, here we come!